Please note that all class registrations are due 1 week prior to class starting. ​Get your puppy off to a good start! Learn the basics like down, sit, stand, walking on a loose leash & not jumping on people....plus coming when called and lots more! For puppies 8-16 weeks only! Class sizes are limited, register early! What is taught: greetings, sit, down, stand, stay, walking on a leash, leave it and coming when called. Strengthen your bond with your dog by teaching them some new tricks that you can show off to others! Polish up on the basics! Walking on a loose leash, coming when called, sit, stand, down etc. ​​​Not offered at this time. Contact us if your interested in this class. Novice Foundations: This class starts building the foundations that you need to prepare yourself for all levels of competitive obedience and focuses on getting into the novice ring. Novice and More: This class is for dogs that are ready to learn the exercises from utility and open while still doing some novice work. 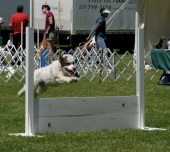 Utility/Open: This class is for dogs that are getting ready to compete in both open and utility. Contact Brenda Proulx for more information and to register. K9 NOSE WORK® STARTING BACK UP! Nose Work® method will build the foundation needed for all venues, NACSW, AKC, UKC, C-wags, USCSS, and SDDA. ​Class sizes are limited, register early! Looking to start in the ring with your dog? Try Rally! You and your dog learn to work together following different signs on a course and performing different obedience challenges. Communication between you and your dog is allowed and encouraged! Not offered at this time. Contact Brenda Proulx if your interested in this class. Learn how to handle your dog in the conformation ring like a pro! Cindy will teach you how to properly stack your dog, gait your dog and give you little tricks and tips to make you and your dog stand out in the ring.